"A vengeful witch and her fiendish servant return from the grave and begin a bloody campaign to possess the body of the witch's beautiful look-alike descendant." I remember when BBC2 first showed "Black Sunday" (or "The Mask of Satan" as it was known in Britain) back in the early '90s. I also remember how it was kind of a big deal for this film to actually be shown uncut on television since it had once been banned. After the hyped-up introduction suggesting that this was the most terrifying movie ever made, I'm sure that I wasn't the only one who was a little bit disappointed by what really amounted to little more than a black and white Italian version of a Hammer horror. I would like to say that my opinion of "Black Sunday" has changed over the years and through repeated viewings but, alas, it hasn't. As much as I can appreciate how controversial it must have been in 1960, it just doesn't have enough scares to satisfy me. 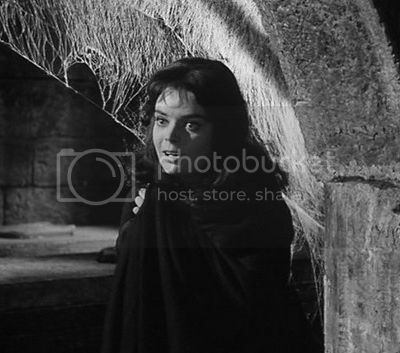 Also, as much as I've always wanted to find something attractive about Barbara Steele, I can't. Finding one still image where she looks pretty rather than harsh or intimidating seems to be impossible. The best I could come up with is the one below and, if you look at it long enough, she still looks as if she's crazy. Of course, it was Barbara Steele's iconic looks which gave her such a successful career in Italian horror movies. She even proved that she could act in most of them although, outside of today's $1 bargain DVDs, none of the movies she starred in were ever as famous (or infamous) as "Black Sunday". So what made "Black Sunday" so special? I'd guess that it was the level of violence in the opening scene which went way beyond what anyone was used to. Although people knew about all the horrific tortures and brutal deaths of witches in the history books, nobody until Mario Bava actually dared to show one in a theatrical experience that you could almost feel. Possibly, it was a combination of the gruesome make-up effects and eroticism which also had the more timid audiences of the time complaining right, left and centre until some kind of action had to be taken. Seeing Christopher Lee bloodlessly biting pretty girls on the neck was one thing even in "technicolor" but letting re-animated female corpses do the same thing in monochrome was far too much. Unfortunately, with the British laws about witchcraft having only been repealed in 1951, the overly moral "powers that were" must have found the rest of the film so Satanic and blasphemous that they banned it from cinemas until 1968. By this time, the make-up effects had become a little bit dated, and Hammer had beaten the vampire genre to death. "Black Sunday" is a weird movie to place in a horror subgenre though because it's not a straightforward vampire story. To me, it's very much about the revenge of a witch, a family curse, and a lot of contrived coincidences designed to straddle as many other subgenres as possible. It has everything from gothic romance to zombies, and, to give it even more credit, it looks fantastic. But, as I said at the beginning, where "Black Sunday" fails for a modern audience is that it just isn't scary anymore. In fact, it's so borderline "hammy" (because I loathe the word "cheesy") that it could almost be something that Elvira or the MST3K guys would have a great time tearing apart. I don't actually know if they did ever do a show about "Black Sunday", of course, because I've never had any interest in watching any of them. 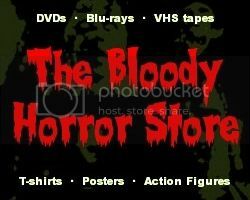 For anyone watching the restored, uncut, super-duper, remastered DVD edition of "Black Sunday" alone in the dark with the wind and rain lashing at the windows, it might still have some life left in it. It doesn't work for me so I'm rating it as average.